Note: Video above is from initial coverage on Friday. STOCKHOLM — The Swedish department store that was rammed by a stolen beer truck, leaving four people dead and 15 injured in Stockholm, said it was sorry for announcing it was reopening Sunday to sell damaged goods at a "reduced price." In a statement on its Facebook page, the Ahlens department store apologized "for a bad decision." It said its motivation "was born out of the idea of standing up for transparency and not allowing evil forces take control of our lives." The store said it would reopen Monday "without any damaged goods." Police said on Sunday they had brought in seven people over the apparent terrorist attack outside the department store on Friday, according to Reuters. A 39-year-old native of Uzbekistan was arrested as the suspected driver of the truck that plowed into shoppers on Friday, according to the Associated Press. Authorities confirmed that the suspect was known to security services and described him as a "marginal character." They would not confirm his status in Sweden. People leave flowers at the scene of a truck attack near Ahlens department store in central Stockholm April 8, 2017. TT News Agency/Jonas Ekstromer via REUTERS ATTENTION EDITORS - THIS IMAGE WAS PROVIDED BY A THIRD PARTY. FOR EDITORIAL USE ONLY. NOT FOR SALE FOR MARKETING OR ADVERTISING CAMPAIGNS. THIS PICTURE IS DISTRIBUTED EXACTLY AS RECEIVED BY REUTERS, AS A SERVICE TO CLIENTS. SWEDEN OUT. NO COMMERCIAL OR EDITORIAL SALES IN SWEDEN. NO COMMERCIAL SALES. STOCKHOLM 2017-04-08 People gather at a police cordon near the crime scene in central Stockholm on April 08, 2017, the day after a hijacked beer truck plowed into pedestrians on Drottninggatan and crashed into Ahlens department store, killing four people, injuring 15 others. TT News Agency/Noella Johansson/via REUTERS ATTENTION EDITORS - THIS IMAGE WAS PROVIDED BY A THIRD PARTY. EDITORIAL USE ONLY. SWEDEN OUT. STOCKHOLM 2017-04-08 Flowers lay on a police car at Hotorget square near the crime scene in central Stockholm on April 08, 2017, the day after a hijacked beer truck plowed into pedestrians on Drottninggatan and crashed into Ahlens department store, killing four people, injuring 15 others. TT News Agency/Noella Johansson/via REUTERS ATTENTION EDITORS - THIS IMAGE WAS PROVIDED BY A THIRD PARTY. EDITORIAL USE ONLY. SWEDEN OUT. STOCKHOLM 2017-04-08 Flowers and a note "Je suis Stockholm" near the crime scene in central Stockholm the morning after a hijacked beer truck plowed into pedestrians on Drottninggatan and crashed into Ahlens department store on Friday, killing four people, injuring 15 others. TT News Agency/Anders Wiklund/via REUTERS ATTENTION EDITORS - THIS IMAGE WAS PROVIDED BY A THIRD PARTY. EDITORIAL USE ONLY. SWEDEN OUT. STOCKHOLM 2017-04-08 People lay flowers near the crime scene, near the Ahlens department store, in central Stockholm the morning after a hijacked beer truck plowed into pedestrians on Drottninggatan and crashed into Ahlens department store on Friday, killing four people, injuring 15 others. TT News Agency/Anders Wiklund/via REUTERS ATTENTION EDITORS - THIS IMAGE WAS PROVIDED BY A THIRD PARTY. EDITORIAL USE ONLY. SWEDEN OUT. STOCKHOLM 2017-04-08 People laying flowers near the crime scene in central Stockholm the morning after a hijacked beer truck plowed into pedestrians on Drottninggatan and crashed into Ahlens department store on Friday, killing four people, injuring 15 others. TT News Agency/Jonas Ekstromer/via REUTERS ATTENTION EDITORS - THIS IMAGE WAS PROVIDED BY A THIRD PARTY. EDITORIAL USE ONLY. SWEDEN OUT. TPX IMAGES OF THE DAY. STOCKHOLM 2017-04-08 People laying flowers near the crime scene in central Stockholm the morning after a hijacked beer truck plowed into pedestrians on Drottninggatan and crashed into Ahlens department store on Friday, killing four people, injuring 15 others. TT News Agency/Anders Wiklund/via REUTERS ATTENTION EDITORS - THIS IMAGE WAS PROVIDED BY A THIRD PARTY. EDITORIAL USE ONLY. SWEDEN OUT. STOCKHOLM 2017-04-08 People laying flowers near the crime scene in central Stockholm the morning after a hijacked beer truck plowed into pedestrians on Drottninggatan and crashed into Ahlens department store on Friday, killing four people, injuring 15 others.TT News Agency/Jonas Ekstromer/via REUTERS ATTENTION EDITORS - THIS IMAGE WAS PROVIDED BY A THIRD PARTY. EDITORIAL USE ONLY. SWEDEN OUT. A turned over 'Stockholmslejon', a concrete traffic stopper, is seen outside the roped off area next to the department store Ahlens after a suspected terror attack on the Drottninggatan Street in central Stockholm, Sweden, April 8, 2017. Jonas Ekstromer/TT News Agency/via Reuters ATTENTION EDITORS - THIS IMAGE WAS PROVIDED BY A THIRD PARTY. FOR EDITORIAL USE ONLY. NOT FOR SALE FOR MARKETING OR ADVERTISING CAMPAIGNS. THIS PICTURE IS DISTRIBUTED EXACTLY AS RECEIVED BY REUTERS, AS A SERVICE TO CLIENTS. SWEDEN OUT. NO COMMERCIAL OR EDITORIAL SALES IN SWEDEN. NO COMMERCIAL SALES. Speaking at a press conference on Saturday, the head of Sweden's National police, Dan Eliason, said security officials had found an object in the truck that "could be a bomb or an incendiary object." On Sunday morning ten of the injured remained in hospital, two of them in intensive care, Stockholm authorities told Reuters. The incident sent shock waves through the country. Sweden's crown princess Victoria held back tears as she left flowers for the victims at the site of the attack on Saturday. "Sweden shall come out stronger from this, and we get through this together," she told the press and mourners gathered near the department store. 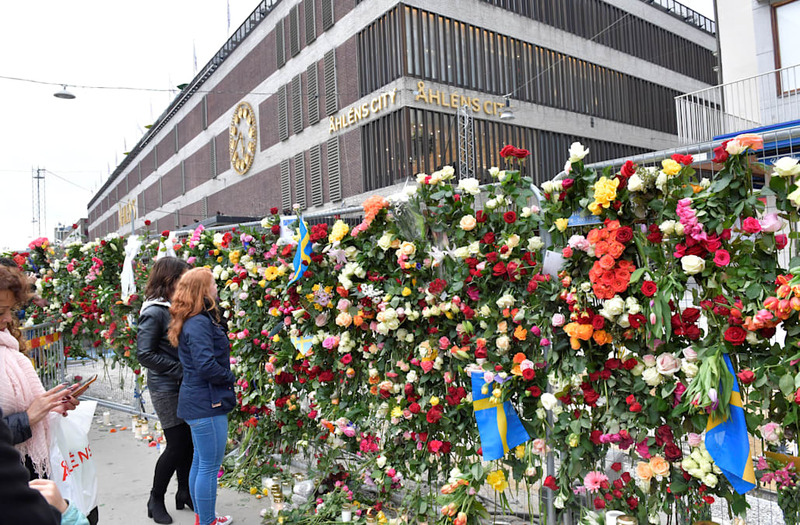 The Swedish TT news agency said city officials planned to move thousands of flowers to a nearby square after an aluminum fence outside the department store threatened to collapse. The fence was put up to keep people away from the broken glass and twisted metal at the attack site, and to allow forensic experts and police to gather evidence.